There are hundreds of inspiring stories at Villa - clients whose lives have been changed for the better, employers who have seen a positive change in their workplace thanks to Villa's clients, and other nonprofits who can provide services thanks to Villa client volunteers. Scroll down to read more about some of the great things happening at Villa. Be sure to follow us on Instagram, Facebook, and Twitter as well where we share inspiring stories and updates regularly! Click through to read more in the Villa Chirp! Natalie is a bright, mischievous 12-year-old. A girly girl through and through, she loves Justin Timberlake, makeup and nail polish, and the latest gossip. 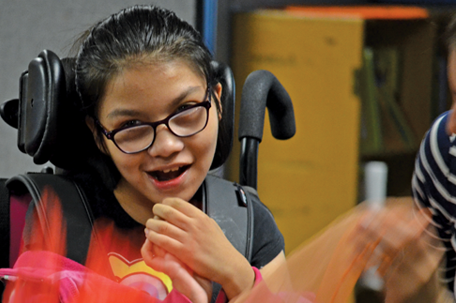 Natalie also has Rett Syndrome (RTT), a neurodevelopmental disorder that affects how she moves, speaks, and learns. Natalie developed normally until she was 18 months old, when she rapidly lost speech and the ability to use her hands. Natalie’s mom Krystal explains, “She couldn't communicate and we would have to be guessing. At Villa I had a good first impression. 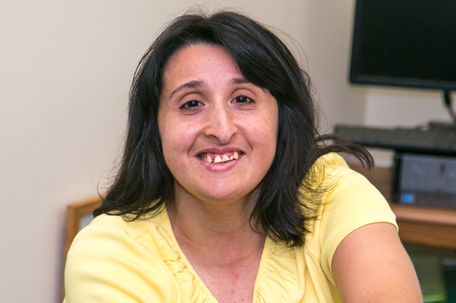 All the staff made me feel at home.” Villa staff started developing communication strategies for Natalie. They contacted Dynavox, the manufacturer of a Tobii eye gaze device that allows users to generate speech through eye tracking and control. 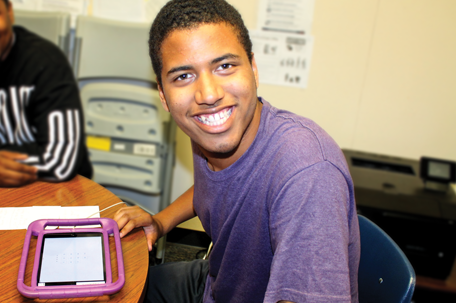 “We convinced them to loan us a Tobii device for 3 months,” Villa Teacher Carol shares. “When the loan ended, we convinced her insurance company to purchase it for her and that was so exciting.” Natalie’s Tobii has given her a voice and the freedom to express her opinion. When you were a kid, do you remember the one thing that always made you feel better? Maybe it was going out for food, playing with your favorite toy, or singing along to your favorite CD. Now, imagine if you couldn’t ask your parents for that one thing that made everything better. How would it feel to finally be able to communicate? Click through to watch Sam’s inspirational story! Click through to read more in Villa's Biennial Report! 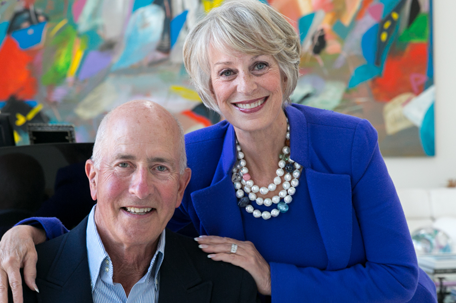 When nationally renowned physician Dr. Ricki Robinson first partnered with Villa to co-found a dedicated autism classroom in the early 90s, she was struck by Villa’s can-do spirit. “We were at the ground level,” Ricki explains. Villa staff, generous community members, and local families joined forces with Ricki and her husband Joel, raising $100,000 to bring the classroom up to code. 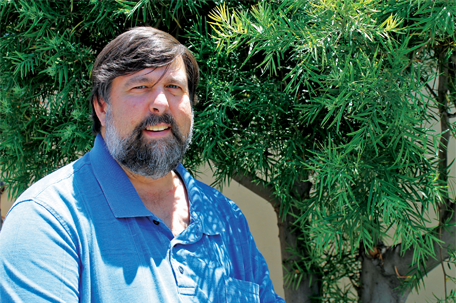 As co-director of the Descanso Medical Center, a practice devoted to children and families affected by autism as well as other neurobiological disorders, Ricki understands that having a willingness to innovate and learn is critical to moving forward. 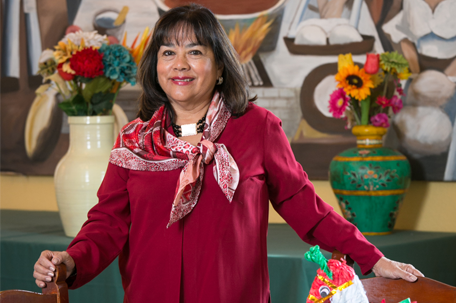 She has brought this understanding to bear while serving on Villa’s Board and committees. 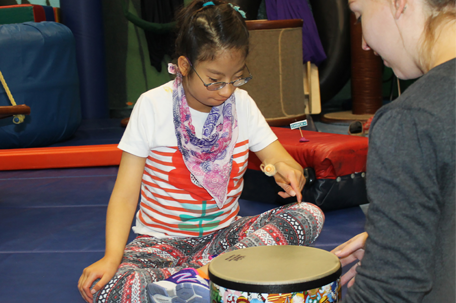 Villa prides itself on the individualized approach to services across its programs. 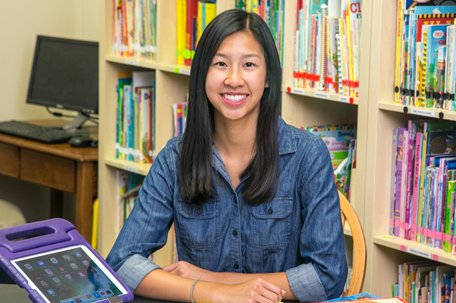 Villa School is no exception, and it is this commitment to a “tailored education” that first impressed parent Wendy Lai-Yeung. 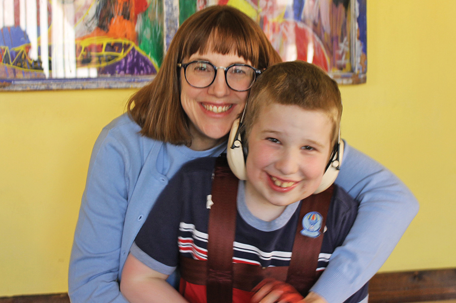 When her son Coen started at Villa School he had limited ability to convey his needs and desires. “He didn’t have any speech,” Wendy shares, “and if he didn’t like something he had no way to express himself.” She never imagined that Coen would one day read to her and understand words, but by the end of elementary school he was doing just that, in addition to mastering multiplication tables. Coen’s progress at Villa goes beyond the academic. 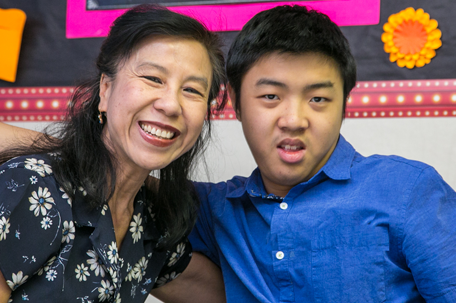 He is a happy, healthy young man embarking on his first year in high school and enjoys working in Villa School’s campus store where he greets classmates and staff members. Click through to read more in the Villa's Biennial Report! When 57-year-old Jackie arrives at Villa’s monthly Social and Service (SAS) Club, she greets the assembled group with a warm smile. 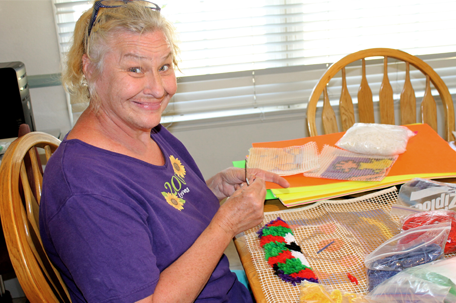 SAS Club is a monthly gathering for Villa’s adults where they socialize and create a craft that will be donated to the local community. Organized with help from the National Charity League of San Marino, it is one of Jackie’s favorite events. She leads the group in reciting the Pledge of Allegiance and singing a patriotic song, which she also signs with hand gestures. “I like the songs and the Pledge of Allegiance and signing for everybody,” she says, her voice full of pride. Jackie learned to sign when she was a student at Villa’s School and has been part of the Villa family since she was 10 years old. 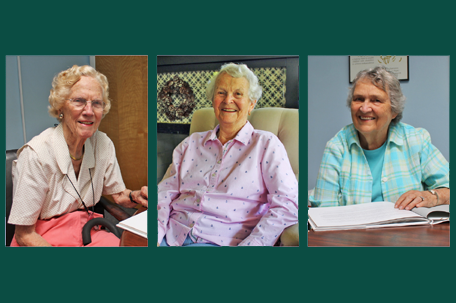 Over the years she has blossomed into a model member of our community, making her mark every day as an enthusiastic participant in Villa’s Residential and Employment Programs. 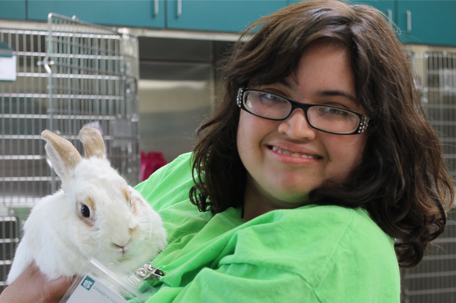 It’s Wednesday morning, and 24-year-old Teresa Castillo can hardly contain her excitement as she prepares for another day volunteering at the Pasadena Humane Society’s (PHS) Rabbit Enrichment Program. “The Humane Society is my favorite volunteer site,” Teresa shares. “I like working with the bunnies and helping them do exercise.” As a client in Villa’s Community Integration Program (CIP), Teresa learns valuable job skills through supervised volunteer opportunities with the goal to transition into paid employment. Teresa assists PHS staff with cleaning the rabbits’ housing area, setting up their playpens, and providing them with social interaction and stimulation. 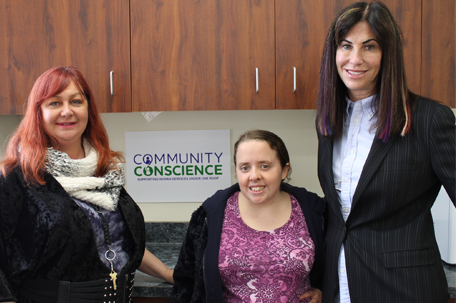 Teresa knows to ask supervising staff for guidance along the way—requesting feedback is just one of the valuable employment skills she has gained through participation in CIP. 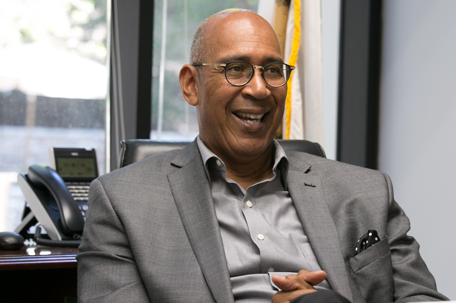 For the past 46 years, James has been a part of our Villa family. He is regarded as a gentleman, a man of integrity and an overall great guy. He’s kind, caring and friendly. James is respected and admired by those who know him including many lifelong friends and Villa staff. He is not defined by his disabilities, but rather his ability to rise above them. 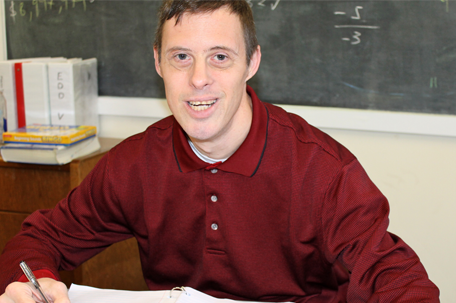 James is representative of thousands of individuals with Down syndrome and other intellectual/developmental disabilities (I/DD) who transcend expectations on a daily basis. When James was born in 1970, services for individuals with I/DD were just starting to take hold. His parents had the foresight to seek early intervention services and enrolled him in Villa’s Infant Center. Starting at the age of six months, the center provided the specialized care and attention that would shape the foundation for his future. Summer camp: it’s a traditional American experience for lots of kids. 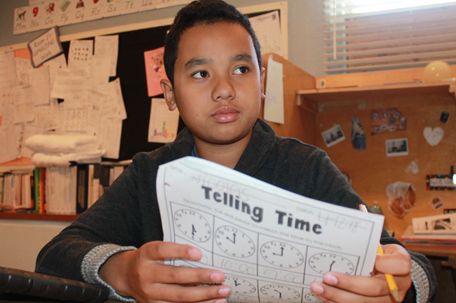 For most kids with intellectual/developmental disabilities, it’s not an opportunity that is readily available to them. Enter our heroine, Girl Scout Gold Award candidate Julia in her role as Head Camp Counselor and creator of “Camp Esperanza.” With support from the staff at Villa’s Speech and Language Center, volunteer Julia spent a year planning and putting together all of the elements to create a fun and educational summer camp experience for students at the Villa Esperanza School, most of whom have moderate to severe autism. For four hours a week during summer session, students left their classrooms and gathered around an outdoor picnic table on the school campus that served as camp headquarters. 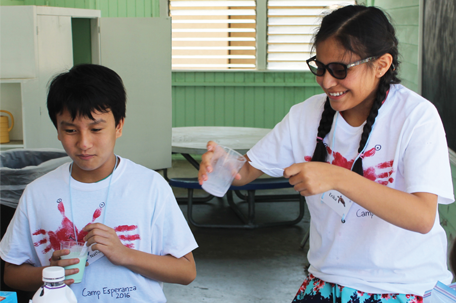 Each camper decorated their own “Camp Esperanza” T-shirt for their camp uniform. It’s 6:00 a.m. and Greg is on the job at the Burke Williams Day Spa in Old Pasadena. He’s focused on a computerized scheduling system that maps out the spa activity for the day. Greg is pairing therapists with clients, assigning treatment rooms and ensuring that all of the appropriate supplies are on-hand and ready to give each guest a seamless, customized spa experience. Greg is a Villa client, one of several individuals with developmental disabilities who have been given the opportunity to work at the spa. 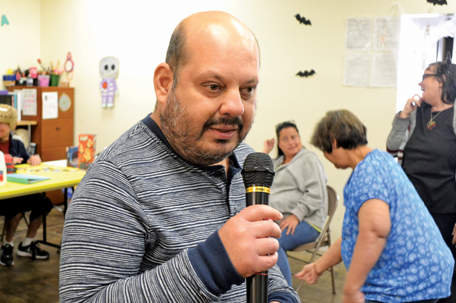 Through Villa’s Employment Services program, our capable adults receive coaching and support to secure and sustain employment with business partners in the community. The Pasadena Burke Williams Spa is an outstanding example of a local business that is not only providing jobs, but also creating promising futures for our clients.